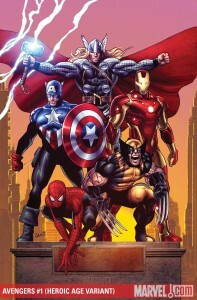 The Avengers have always represented Marvel Comics’ heaviest hitters, from their beginning with Captain America, Iron Man, Thor, and Hulk, to today’s team that features Wolverine, Spider-Man, and Captain Marvel. You might love those characters and the recent movies that feature them, but when it comes to comic books it’s easy to get lost. Avengers have appeared in comics for over fifty years. Where should you begin… and how? Luckily, many those single issues are collected into graphic novels – hardcovers trade paperbacks, or “TPBs.” Figuring out which collections to buy and in what order turns out to be a very complex task – half research project, half detective novel. I’ve taken all the work out of it for you. This guide can help you figure out what trade paperback to buy no matter what run of Avengers comics books you’re looking for. If it’s collected in a graphic novel, it’s in this guide. Each of the following pages contain the titles, issue ranges, ISBNs, and links to the Avengers collections from each ongoing title. 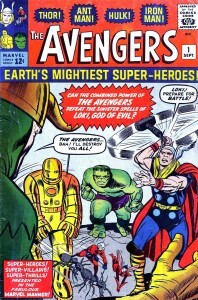 The original Avengers ongoing title spanning Silver, Bronze, and Modern ages. The first Avengers spin-off team, it prominently featured Iron Man and Scarlet Witch for much of its run. This team of heroic villains debuted while the Avengers were in the Heroes Reborn universe, and later spawned the Dark Avengers. A brief 1996 re-launch of the Avengers, followed by an ongoing that eventually rejoined the numbering of the original 1963 title, to end at issue #503. The title launched from the ashes of Avengers Disassembled in 2005. Two titles spinning out of major events in the run of New Avengers.. Titles about young and in-training groups of Avengers – including Young Avengers, Avengers: The Initiative, Avengers Academy, Avengers Arena, and Avengers Undercover. Two supporting Avengers titles launched about covert ops teams. Secret Warriors concluded in 2010. In 2010 Avengers relaunched a side-by-side flagship titles, which Marvel has maintained through multiple reboots. This includes any closely-linked sibling-title, such as the 2014 expansion into Avengers World. The guide to collecting every X-Men comic book, ever. Over 50 years of Fantastic Four comics in one easy-to-follow collection guide. Marvel Universe Events – Marvel has executed regular line-wide crossovers ever since Secret Wars, and they frequently center on our favorite merry band of mutants. Find out how the Avengers were involved in each event, and make sense of the main story without buying every comic involved. Seeking the solo title of your favorite Avenger? Never fear – visit Crushing Comics to find over a dozen individual Avengers pages, with more added all the time!